For those of you who like water activities, scooping water is another basic Montessori style tray activity for toddlers. Great for the sensory table, as a table activity or perhaps even a highchair activity if you can fit it on. Most toddlers love to play with water and this gives them a contained way of enjoying water while practising a worthwhile skill at the same time. If you are not afraid of colouring clothes then a few drops of food colouring adds interest. Ice blocks can also be added, as can a variety of floating objects to scoop out. 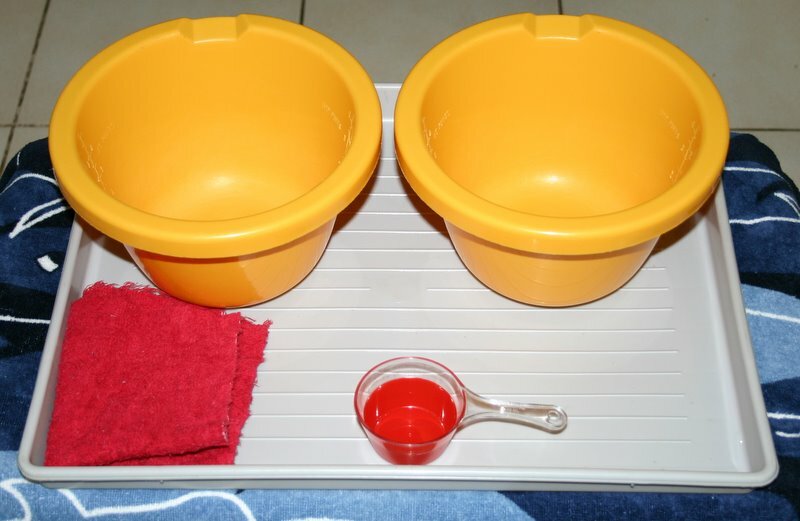 The child uses the scoop provided to transfer the water from one bowl to the other and back again. I normally include a small sponge to use for soaking up spills and squeezing the water back into the bowls. The cloth is for drying up the scoop and tray when the activity is done. A variety of scoops and containers can be used to keep the activity fresh and interesting over time.